About four percent of the Ghanaian population have now taken to small-scale mining as it offers greater job prospects than mainstream mining, policymakers have said. The regulator of the mining sector, the Minerals Commission, says that more than one million people are now engaged in artisanal and small-scale mining, placing the sub-sector as an important component of government’s poverty reduction strategies. The Minerals Commission, which has developed a comprehensive framework to guide the development of the sector, is confident the successful implementation of some policy recommendations for the small-scale mining subsector could spur socio-economic growth without harming the environment. 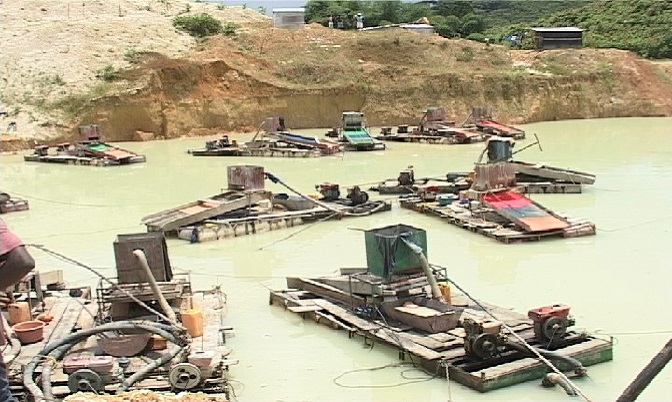 Available figures from the Minerals Commission show that since 1990, a year after a law was passed to make small-scale mining a legal activity, gold production from small scale mining — by both legal and illegal miners — jumped by 8,544 percent to reach a little above 1.4 million ounces, making up about 34.3 percent of total gold production in the country. The contribution of small-scale mining to economic growth is expected to rise further as more people have in recent times turned to the sector for their livelihood in the face of dwindling job prospects. The activity has also been on the ascendency because of the rise in gold price and availability of simple mining and processing techniques among others. Minerals and Mining Act of 2006 (Act 703), has aggravated the issue of illegalities in the mining sector as some foreigners operate with guns and even threaten community members who stand against their operations. However, the Minerals Commission is convinced implementation of the policy recommendations will help to curtail the dangerous aspect of small-scale mining in the country. “While the policies enshrined in this document do not provide an all-round panacea for all our land problems, they provide the framework and direction for dealing with the issues of land ownership, security of tenure, land use and development, and environmental conservation on a sustained basis,” the Commission said in its policy framework to government. Some of the many policy recommendations formulated by the Minerals Commission includes developing a more proactive stance on identifying and demarcating areas ‘suitable’ for small-scale gold mining activity, promoting integrated land-use planning — taking artisanal and small-scale mining into account; improving licencing procedures, facilitating formalization, control and support to artisanal and small-scale miners; and developing an efficient tax system for the sector among others.